The past couple of days Jeffrey and I have been working on the exterior of our house. It is amazing what a little bit of paint can do. 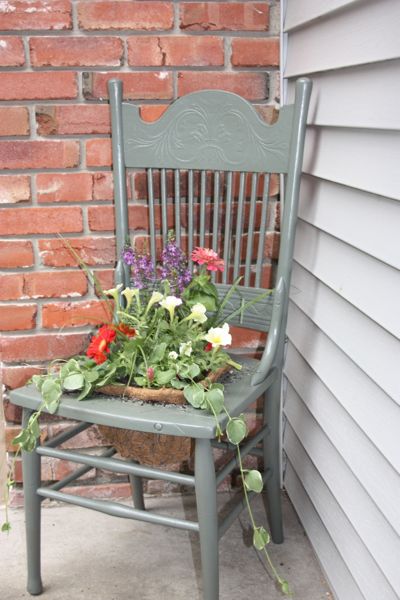 In the process of painting the door and trim I also put together this chair planter. I have wanted to make a chair planter for quite sometime. (I think I first saw this project in a Southern Living magazine 8 years ago.) My neighbor (who frequents garage sales) found a great chair for me about a month ago and I knew it was finally time. The wicker bottom of the chair was already broken which was fine by me since I didn’t want a bottom in the chair anyway. The chair only cost $10 which made this project very affordable. I already had some chicken wire at the house and the only thing I needed to purchase after finding the chair the peat moss I used to line the chair and the plants for my planter. I painted the chair to match our front door and it looks great sitting in the corner by the door. If you are looking for a unique planter and a fun weekend project, this one left me feeling quite accomplished and it also brightened up our front entry. 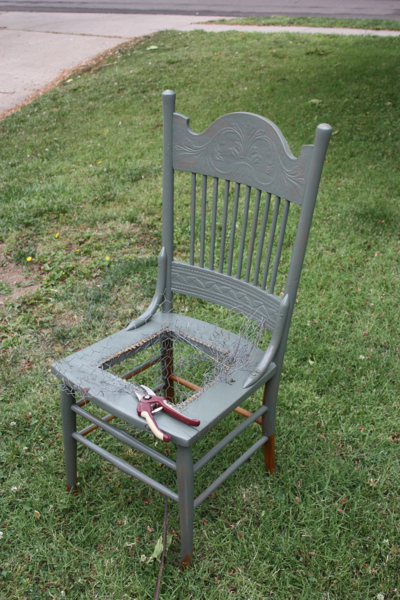 Find a chair remove the seat (this is why I wanted a broken seat) and paint it the color of your choice. 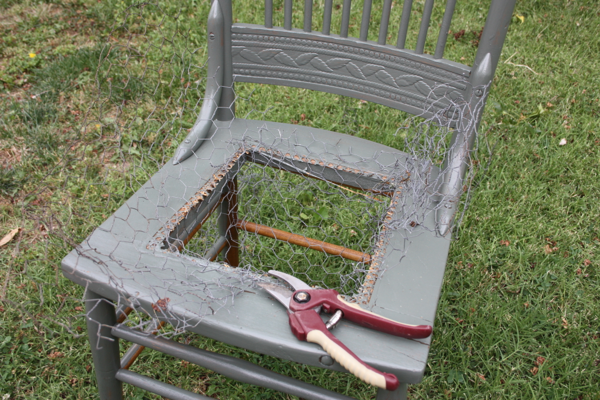 Secure some chicken wire with a staple gun to make a form in the seat of the chair. 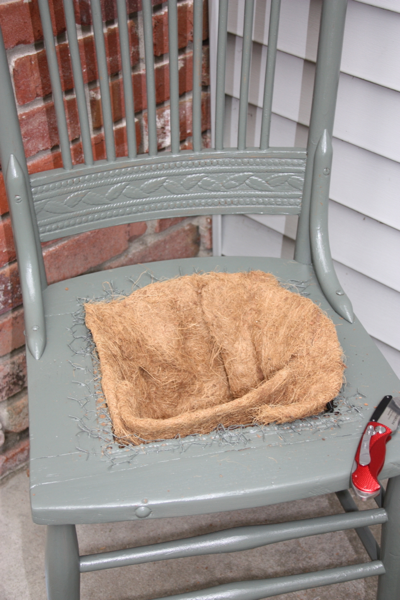 Fit a peat moss basket liner into your chicken wire form in the seat of the chair. Finally, fill the chair with dirt and plants of your choice. 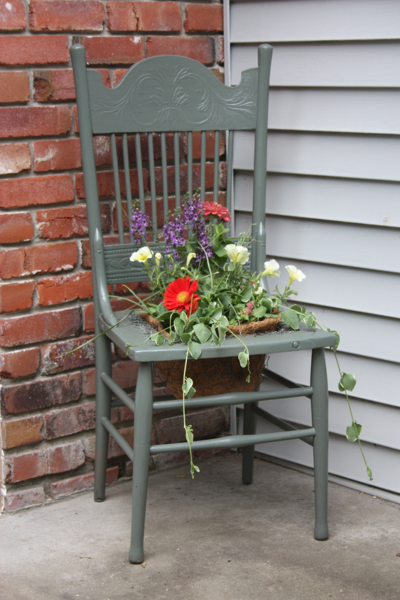 2 Comments on "Chair Planter"
I also have wanted to do this project for years but have never taken the time to find a chair. Now I see how beautiful the end product is I willl be stopping by yard sells to find my chair. Very pretty! Thanks for keeping me inspired and trying new things! Thanks Melissa! It really was a fun project and I love the finished project. If I see any chairs sitting on the side of the road I will let you know.